Softer, skin friendly top sheet, neutralises odour. Suffer from unexpected leaks that happen when you cough, sneeze, or laugh? A lot of women do, and the can be very embarrassing if you aren’t prepared. Wearing pads is the solution but most pads are bulky and uncomfortable, they can remain damp for a long time if you don’t change it which can lead to skin irritation and unpleasant smells. Attends Soft are small body shaped pads with a breathable back sheet, designed to manage light urinary incontinence. The pad has an absorbent core to help reduce the risk of leakage, provide odour protection and skin dryness and comfort. 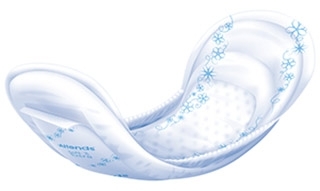 Attends pads feature an Active Zone, an area centred in the middle of the pad, which provides fast absorption exactly where it is needed for optimum absorption. Quick-Dry technology is used in the active zone directly below the top sheet where the urine enters the pad. It quickly absorbs urine away from the skin and into the pad and traps it there to prevent the urine returning to the surface. It can handle several gushes of urine without affecting how the pad works which results in exceptional skin dryness and leakage protection for the user over a period of time for less irritation and more comfort. The pads are made using a breathable material that allows air to get to the skin to enable it to breathe, which again, contributes to improved skin health. To ensure the pads are comfortable to wear there is a super soft and skin friendly top sheet that makes it almost impossible to even tell you are wearing a pad at all. Fixation tape allows the pad to be worn with close fitting underwear for extra discretion and comfort. One problem with many pads is that if they are left for more than just a few minutes then unpleasant smells can begin to develop. Attends utilises natural odour protection reduces the risk of unpleasant smells, this means you can wear the pads for much longer without worrying about the embarrassment of smell. Soft foam elastic around the edge of the pad helps to provide a natural cup shape for improved fit and to reduce the risk of leaks out the side when there is a lot of liquid all at once.